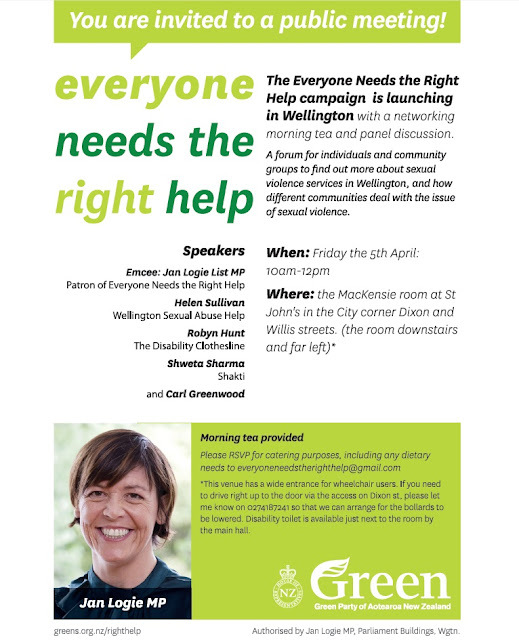 Something to go to - launch of the Everyone Needs the Right Help campaign in Wellington with some pretty fabulous speakers. Helen Sullivan has been managing HELP, a specialist sexual violence survivor agency, for ten years and is a passionate advocate for survivors. Robyn Hunt is a disability advocate with decades in the area, and the Clothesline Project is a groundbreaking opportunity for people with disabilities to name the kinds of interpersonal violence they experience - sexual violence, domestic violence - and break the silence around the impacts of that abuse. Shakti support women and children from ethnic minorities experiencing violence within their families. Carl Greenwood, formerly of the New Zealand Aids Foundation, is speaking about sexual violence within the queer community. All this and a real live feminist MP. It's going to be a hell of a launch. See you there.